Can Linchpin Intranet synch up with Azure and the other apps from Microsoft? Do you work through Azure? We are moving over to Microsoft Azure? This question needs interpretation. So please help us understand your needs better by refining your questions and giving us more details. Can Linchpin synchronize with Microsoft tools? In general you should assume that this is not possible to synch in both directions. But getting a result from one system in the other should be possible. There are hundreds of ways to get data from Confluence, which is the basis of Linchpin into Microsoft software like SharePoint, Word or Outlook. Writing back from there into Confluence is hard and in most cases not supported. You can export Confluence pages to Microsoft Word and even style them there (Basic features, high end with Scroll Office, Comparison). You can subscribe to Confluence Team Calendars with Outlook. See Atlassian Community for more discussions about this. You can have a unified search for SharePoint and Confluence and integrate lists and other content vice versa (add-on, pricing). Does that help you? If not, feel free to schedule a call with a Linchpin expert here. Microsoft Azure is using a different Active Directory (AD) than the usualy BTF AD that companies deploy today. This is not yet officially supported by Atlassian, although there are some cases where it works. Single-Sign-On (SSO) as we know and implement it today is not possible and new solutions need to be tested that may induce additional costs that are higher than our affordable solutions today. We do have customers who want us to evaluate if Azure is a valid option. This is currently work in progress. We think that running Atlassian software in an Azure environment is experimental as of now. 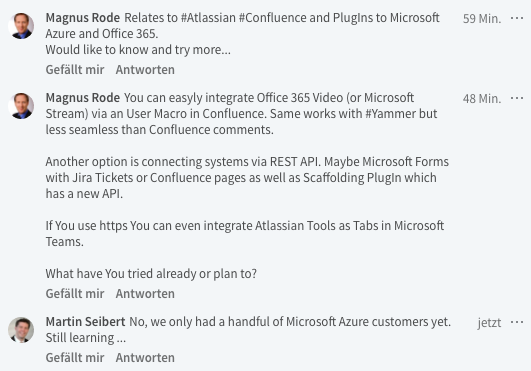 Atlassian is providing support for Microsoft Azure from now on. It was just announced during Atlassian Summit 2017 in San Jose, USA.